Now also my fourth DevMaster is finished. Again with a 32bit processor with ARM7 core. 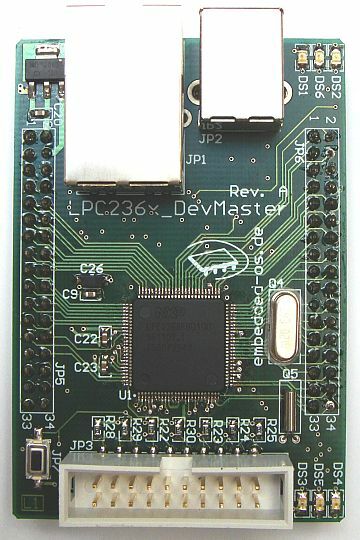 Now the SAM7XCxx_DevMaster and the LPC236x_DevMaster can be used for direct compares between this two. Like already with the previous DevMaster-boards probably remained due to the interface desires and compactness again only 'do-it-yourself'. The result is in the following specified. 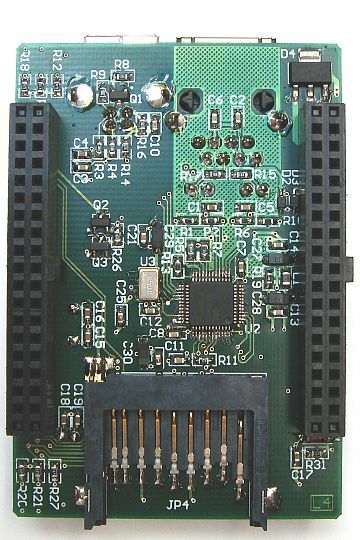 The produced Header-pinning puts thus up to the Ethernet-interface all further pins of the MCU at the free disposal. And so all pins (up to the two USB pins P0.29 & P0.30) can be used as desired as PIOs or UART,CAN,SPI,I2C,I2S, SSP,PCK,PWM,CAP... for own ideas.